CU3OX 1.7.3 - Download Win Apps. Create an attractive flash image slider with 3D slice effects and transitions!. With CU you can create an attractive image slider with cool 3D slice effects and transitions between slides. You'll be able to divide your images into any number of pieces and rotate them the way you like! CU uses the Tweener engine, which makes it support several tween types for the transitions, such as Cubic, Bounce or Elastic. 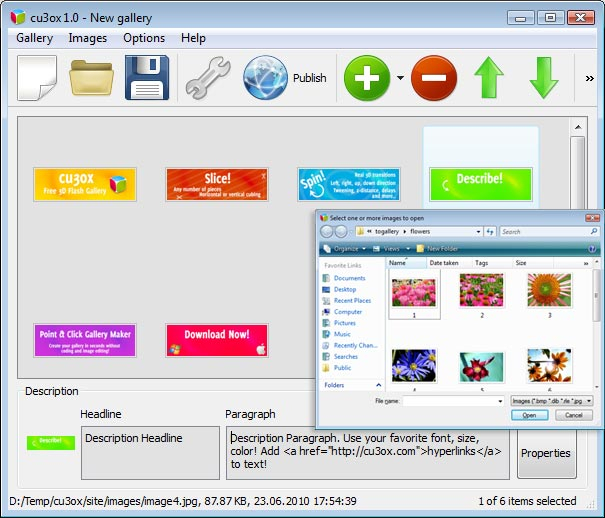 Use CU to create content slider, image galleries, image & banner rotator for your website.